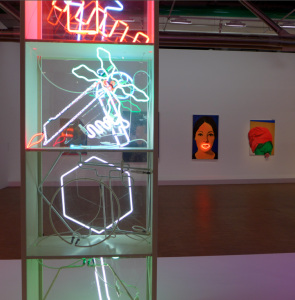 I’d never heard of this French artist when Mr French insisted we go see his show at the Pompidou last week. As we strolled through the fun, colorful collection of his art, I started learning more and more and today, I’d consider myself a fan. Raysse was born in Vallauris, on the Côte d’Azur. The town was put on the international art scene when Picasso started collaborating with its thriving ceramics industry. Jean Cocteau was dran to the area, which is how he met Raysse. The two did a joint show together in 1958, when Raysse was only 22. 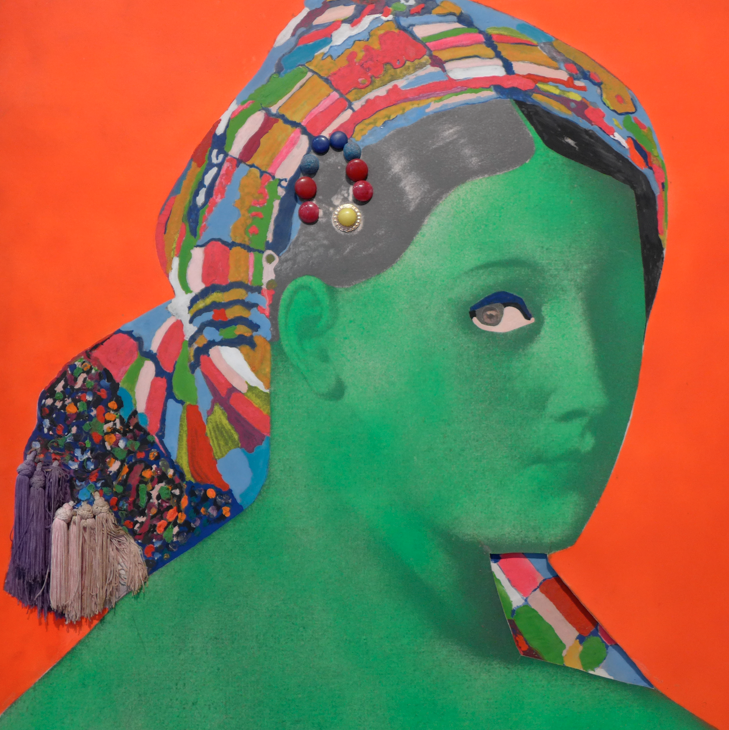 The young artist was fascinated by the Pop Art scene in New York and traveled there to meet the Warhol crowd before returning to France and founding the Nouveaux Réalistes with others, including Yves Klein, Christos and Niki de St Phalle. 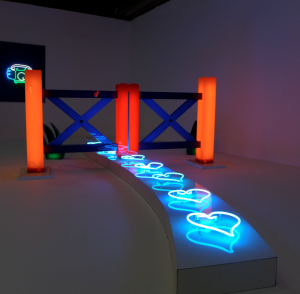 Their concept was “the poetic recycling of reality.” If you now the work of these artists, then Raysse draws on color as the primary source of power for his work. If the artist bases his work on poetry, it is the Haiku, or Limerick. His work is short and sweet and a delight to take in, although I suspect that a lot of the fun was drug induced, particularly the short films he made with his friends. The show is presented chronologically. His earliest work features plastics and garbage that has been recycled into art. Of course, in the 1950’s that was a fairly avant garde concept. 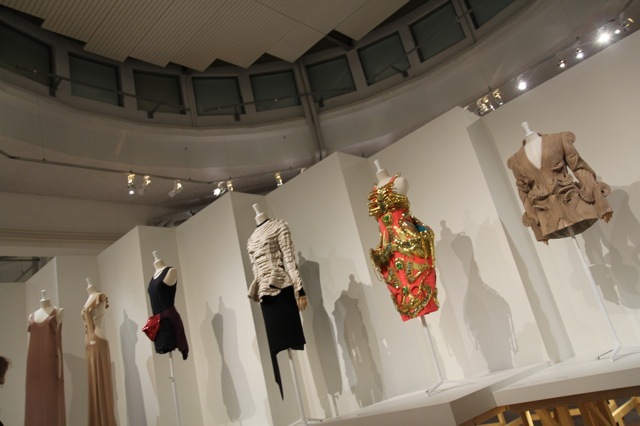 But in 2014, my heart sank when I first entered the exhibition. Turning the corner, I saw some interesting neons and my attitude shifted, filling with a healthy curiosity to discover more. Mr French & Me… a work of art? Mr French loved the neon work, and a collection of 1950’s pin-ups that decorated a beach scene, with imported sand and a working jukebox. I’m a sucker for interactive art, so I really got into the Moroccan tent with a true to scale palm tree and sand visitors can draw on. 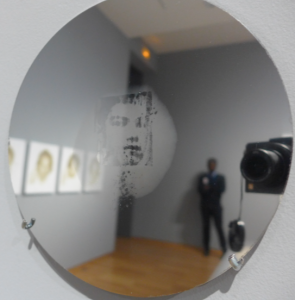 And then I loved, loved, loved a work called “Identity, Now you are a work by Martial Raysse,” which projects viewers into the work. By the time we came upon his most recent work, a rapturous ode to youth, depicting Bacchus at play as a young boy, my heart was singing with joy and I was totally hooked. If art is what moves you, then this is great art, because that is exactly how I was feeling as I left the show. Great. Many francophiles share a classic dream or fond memory driving into the French countryside, using rural roads where there is nothing but picturesque villages with the occasional old man in worker’s blues shuffling by, smoking a hand rolled cigarette. In the fantasy you stumble upon a restaurant that no one has ever heard, full of locals enjoying haute cuisine for the price of a pizza. 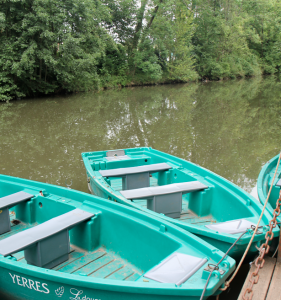 Wednesday, we had access to a car, so I headed out with E to the explore today’s reality of that dream, destination; Yerres, a small riverside town south of Paris. We headed through the bustling Chinatown district of the 13th to avoid the highway. Piles of exotic herbs spilled over the stands of an impromptu market, perfuming the air as crowds of jay walkers became a serious menace. Crossing the Periphérique, the ring road, our eyes met apartment blocks in every stage of a building’s life cycle; from construction zones to demolition sites. We were no longer in Paris. Locals crowded the large bus stops wearing African wax cloth, inner city street clothes, head scarves. The new face of France is young, dynamic and wearing lots of color. Soon, we were near MacVal, a contemporary art museum with one of my favorite works of art, an interactive video by an artist named Gupta. There was a rail yard with an intriguingly picturesque set of abandoned rail cars. We stayed along these suburban roads, following the Yerres river to a stark parking lot and spilled out of the car, to find ourselves facing a large, white wall. Propriété Caillebotte was carefully stenciled on the wall in a sedate grey. 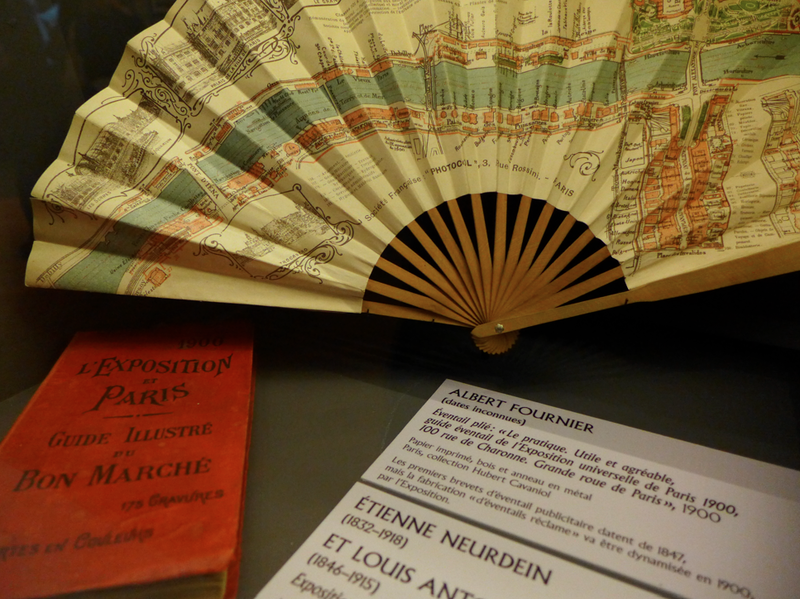 We had come to see the Impressionist artist’s works which are temporarily on display in the home that had once belonged to his family. I had not done much research before heading out on this adventure, so I was delighted to discover that there was much more to the show than just 40+ paintings. The home is part of a large park with lots to offer, including the gourmet restaurant that is part of the francophile dream. The art collection was in the family’s old farm house. 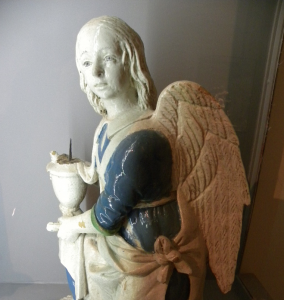 A lot of the pieces were on loan from private collections, or museums in the US. 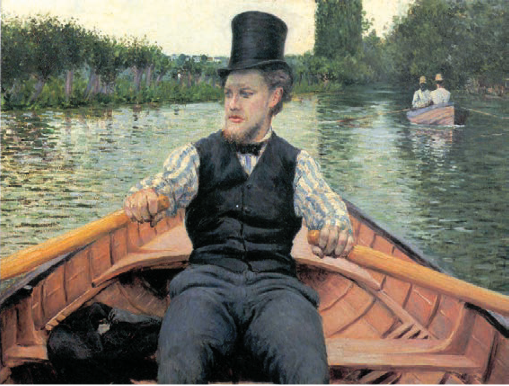 In France, Caillebotte had been considered something of a dilettante and had never been able to create much of a following. 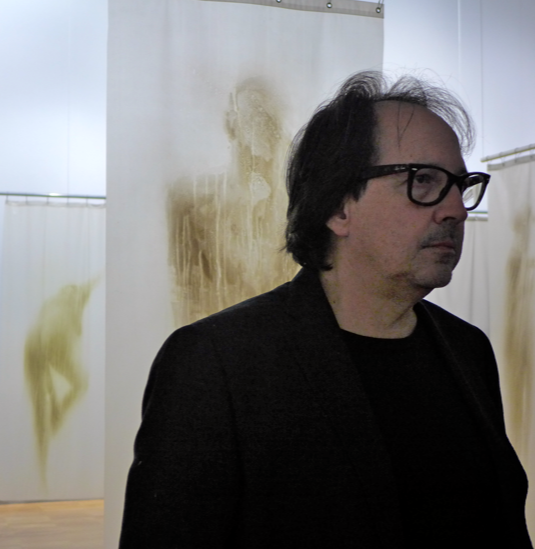 My very favorite piece, Les Raboteurs, was not part of the show, nor was his most iconic painting, Jour de Pluie. This meant we really spent time appreciating and enjoying a variety of his work. It was a bried, yet lovely moment with art. The show ends this Sunday, but even more spectacular are the grounds themselves, so it is still worth the trip, and I was assured that there will be more show in the future. There is an expansive lawn framed by pristine flower beds and picnics are allowed! There are rental boats for rowing along the Yerres and an impressive collection of massive trees, many of them planted in honor of locals on their birth days. There is the gourmet restaurant, Le Chalet du Parc, with an elegant outdoor terrace at the farm house, or the more modest cafeteria in the old Orangerie. 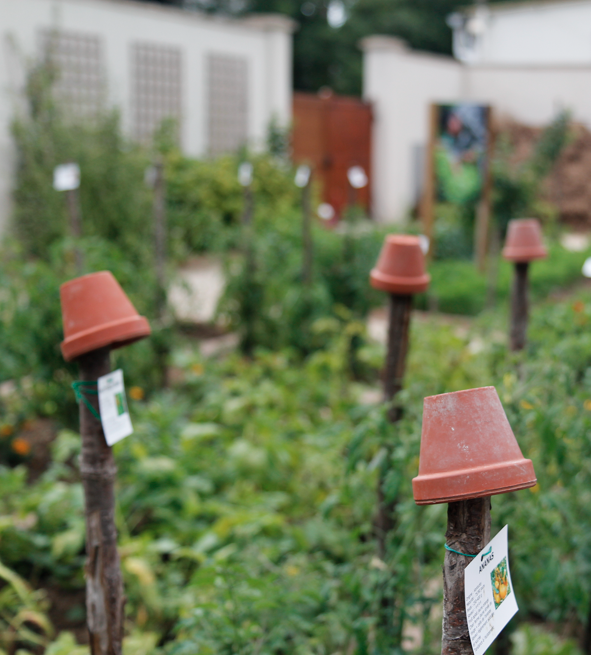 The most popular attraction is the large kitchen garden that is maintained by local volunteers. Everything in the garden looked picture perfect, including the work shed full of wheelbarrows. On weekends visitors can peek into the historic glacière where they kept ice before electricity made freezers and option. The place was alive with happy energy. The family’s home can be visited, and a chapel is currently being restored. Entrance on to the grounds is free, so it is full of locals enjoying the outdoors. 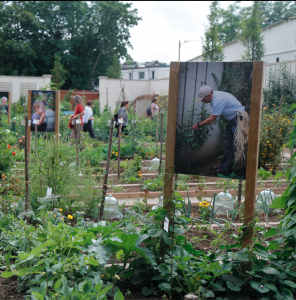 The park is available by RER, and there is even a program to stay with the locals for those wanting to turn their visit in to a real adventure. Click here for all the details. Monday was Bastille Day and we spent the day running errands before Mr French jetted off on yet another business trip. By evening I was alone and in no mood to face the crowds around the Champs de Mars, so I slipped on my walking shows and headed to the Flore to watch the world go by of a glass of champagne with peach liqueur. I learned something that evening. The 14 juillet turns entire quartiers into atmospheric ghost towns. I had the entire neighborhood to myself. It was eerie and magical and utterly divine. 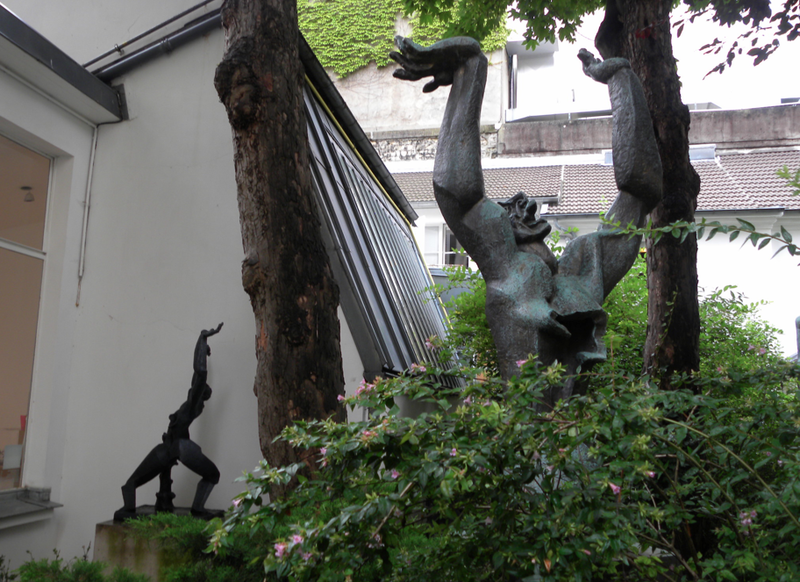 Last Thursday I took Sylvia’s suggestion to visit the Zadkine Museum on the well-known rue d’Assas in the 6th district, in the heart of the Latin Quarter. I hadn’t heard or read much about it so I didn’t really know what to expect. 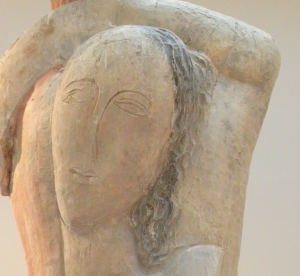 From the brochures I had briefly skimmed through months ago, I knew that some of Zadkine’s works had elongated faces and bodies, similar to his friend Modigliani’s paintings. I was looking forward to learning more. 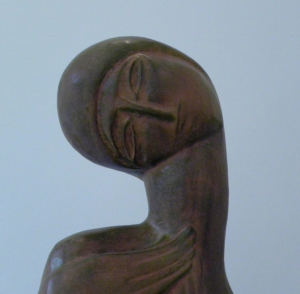 Ossip Zadkine moved from Smolensk, Russia to Paris in the autumn of 1909 at the age of 19, after a short stay in England. Working for awhile out of a studio in the La Ruche artists’ community in the 15th district, he moved to the house at Rue d’Assas in 1928, where he lived and worked until his death in 1967. He spent a few years in the United States after World War II and became an art teacher upon his return to Paris in 1945. The sculptor’s wife Valentine Prax, an artist herself, donated the property, which became the museum, to the City of Paris in 1982. The house/museum is barely visible from the street, and is located right next to the Panthéon-Assas University Paris II. Visitors enter a courtyard and walk through a peaceful garden, to the entrance area, which doubles as a sales desk/bookstore. A soft-spoken reception lady handed me a visitor’s guide, only available in French that day. There was a guided tour in Room 1, so I bypassed them and began my visit in the garden, which was a good way to get an overview of important works dating from 1930 to 1965. Zadkine worked with wood, marble, terra cotta, granite, bronze, cement, and plaster, and was influenced by different styles: Primitivism, Cubism, Greek and Roman classical, and African art. He also produced many drawings and engravings. What struck me most was how sparsely populated this museum is, and for a simple reason: it houses only a mere selection of the artists’ work, the rest having been moved in 1988 to a second museum in the village of Arques, where the artist spent his summers. Each of the six small, airy rooms and the separate garden workshop building tastefully displays between two and seven sculptures, and there are another ten in the garden placed among sycamore trees or on a small lawn. So, the visitor has plenty of time and space to appreciate them, without feeling crowded or bothered by other visitors taking “selfies” with the works (there were none that day). I found the larger-than-life sculptures particularly interesting : “Torso of the Destroyed City” in bronze visible in the garden, “Rebecca” or “Big Water Carrier” crafted in plaster displayed in Room 2, and “Prometheus” sculpted in elm, housed in the garden workshop. 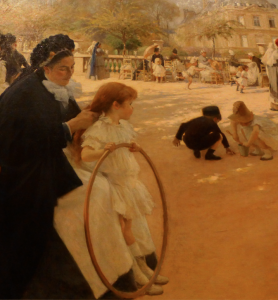 Visitors can actually walk all the way around each of these works to admire the detail. After my visit I took a quiet stroll in the Luxembourg Gardens, only a few steps down the road, bringing my Inspiration Thursday afternoon to a lovely conclusion. Open every day except Monday and public holidays. 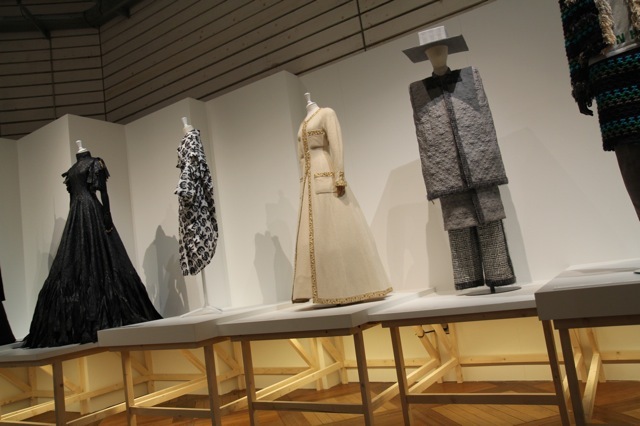 The permanent collection is free of charge to the public except during temporary exhibitions. 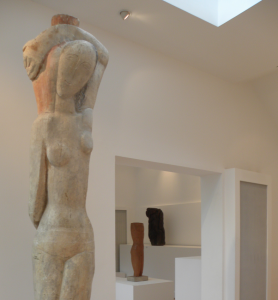 Group tours may be organized by contacting the Bourdelle Museum at 01 49 54 73 73. When we moved to Paris, most of the city’s monuments had been scrubbed clean, and reguilded for the millenial celebrations of 2000. Stones the color of chimney ash brightened the skyline, locals would gasp as the glistening gold-leaf of the Opera Garnier. The city had on her very best dress and she was ready to party. 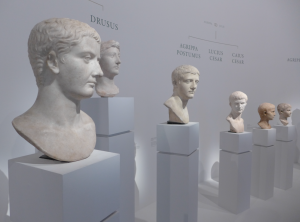 And the party hasn’t stopped, with the Palais de Tokyo re-inventing itself as the largest contemporary art space in Europe, the Galliera fashion museum getting a new do, and the Pantheon currently getting a make-over. One of the longest, most mysterious renovations, was at the Tour St Jacques in the very center of Paris. The tower stood there, all sooty and grey for decades, then disappeared under a white robe for years. And years, and years. The sheath was there to protect passers by, who were at risk of being squashed by large bits of stone that had starting falling off the 52 metre high structure. It became so dangerous the surrounding park had to be closed to the public. Last year the repairs were complete, the tower was unveiled and visits were possible. Possible but very difficult to arrange, as it is only open during the summer and the very narrow, spiral staircase of 300 steps, can only take a handful of visitors, who must be accompanied, at a time. With a zinc roof, it is also a natural lightening rod, making visits during (the rather frequent) rain showers so risky, the tours get cancelled. Last Friday, the tower re-opened for the season, and you can bet I was there, not caring too much (well, maybe just a little…) that I was going to be missing the first 20 minutes of the World Cup France – Germany quarter finals. 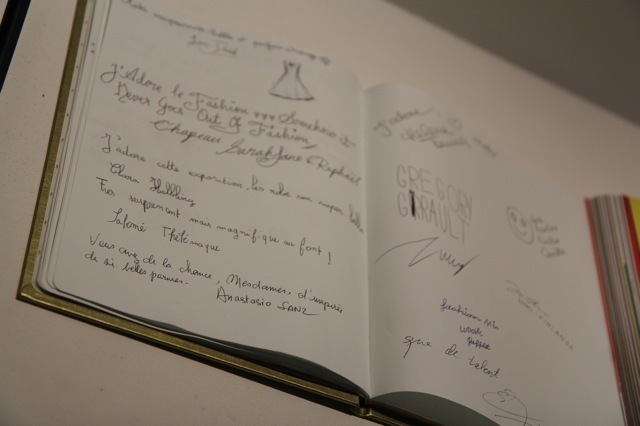 The tours are organized by Des Mots et Des Arts. 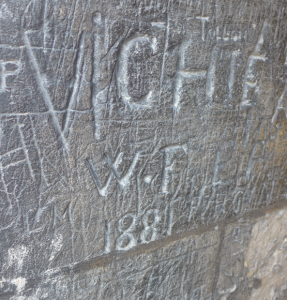 The guides are young art historians, with a contagious enthusiasm for history and the tower. I arrived a bit early and waited in the small garden around the tower, the fragrance in the air reminding me of home. More specifically, the parks near the Haight-Ashbury in San Francisco and I was bemused by the number of young people with backwards baseball caps and skateboards learning how to roll their own. 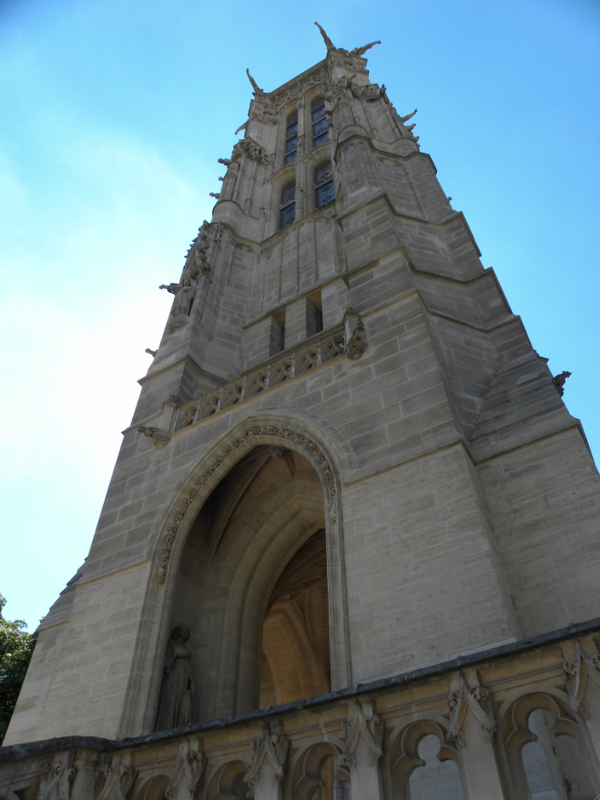 The Tour Saint Jacques is a Flamboyant Gothic bell tower, a modern 16th century addition to a 15th century church, St Jacques de la Boucherie. Boucherie is French for butchery and the church was surrounded by butcher shops and other businesses, including the public writing studio of Nicholas Flamel, who is buried below. For the last 600 or so years, it has been the starting place for the pilgrimage to St Jacques de la Compostelle. Following the French R evolution the government owed a lot of money to a local businessman, so they gave him the church and he took it apart, selling the stones off to the highest bidders. Since then, the tower has inspired artists, scientists and intellectuals. Dumas wrote a story set in the park, and it is believed that Blaise Pascal used the site for his experiments with atmospheric pressure. After learning more about the history of the site you get to go up those 300 steps. But not all at once. There are two landings to explore. 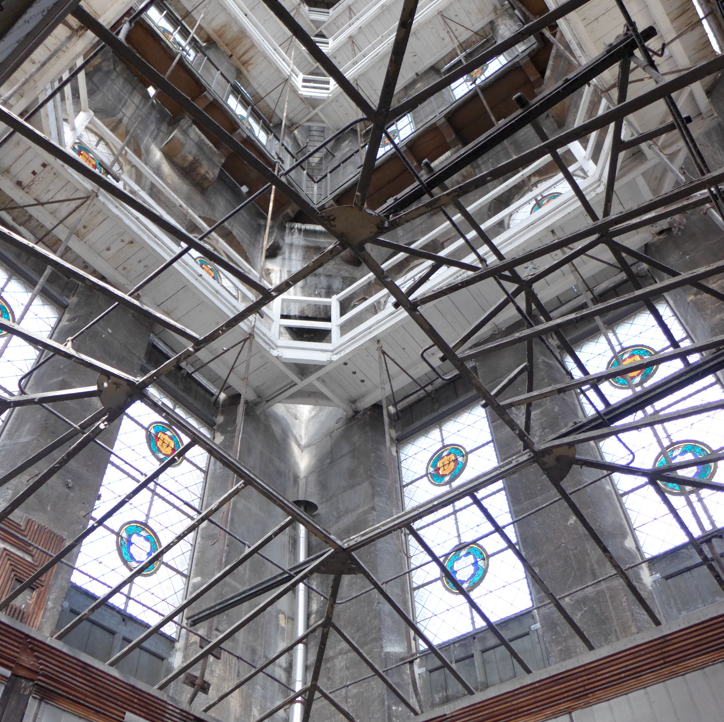 One a tiny warehouse for gargoyles, the other an old weather station with spectacular stained glass decor. 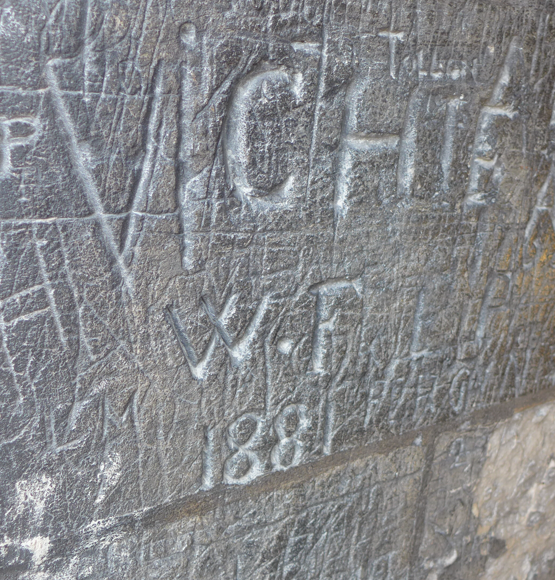 Going up, the walls are blackened for the soot of lanterns of 18th and 19th century visitors who left some intriguing graffiti along the way. 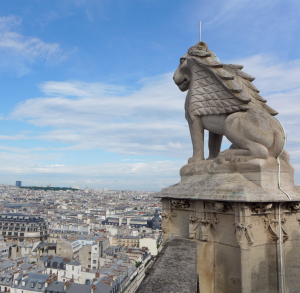 The views from above are spectacular, with every important monument in sight. 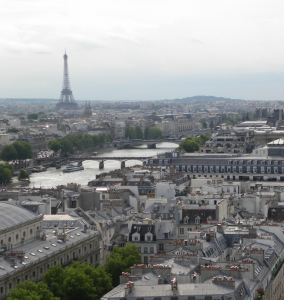 Alot of the people on our tour were Parisians, who spent their time above trying to find their homes and locate personal landmarks, reveling in the wonder of having Paris at our feet. A giant merci to Karen from Inspiration Thursdays for letting me know the tower was open, joining me on the visit and for her fantastic photos! It is one of those BIG life questions, that no one has really answered. Mr French and I spend so much time exploring art that the question comes up often, especially as our tastes tend to be wildly different. Is it art? design? or just a really bad joke? Sometimes it can be hard to tell and my mind races to the tale of The Emperor’s New Clothes. 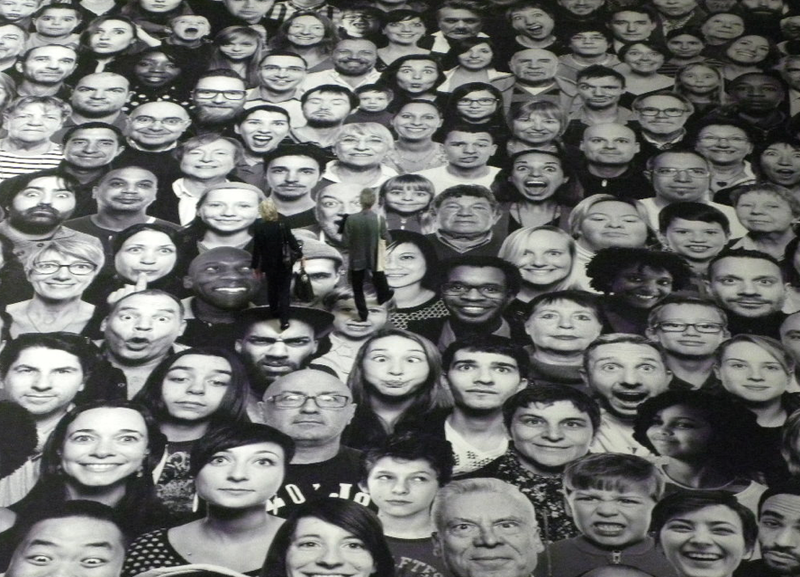 The question has been surfing the airwaves lately, questioning the legitimacy of street artist JR. The artist’s work is currently decorating the top of the Pantheon, while it under goes renovation with a monumental installation inside the memorium, until Oct 5. 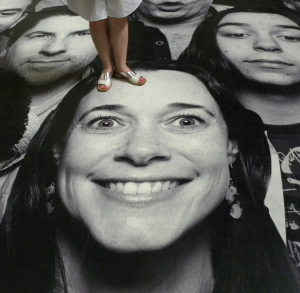 This isn’t the first time JR has graced the city with his astonishing photographic work. 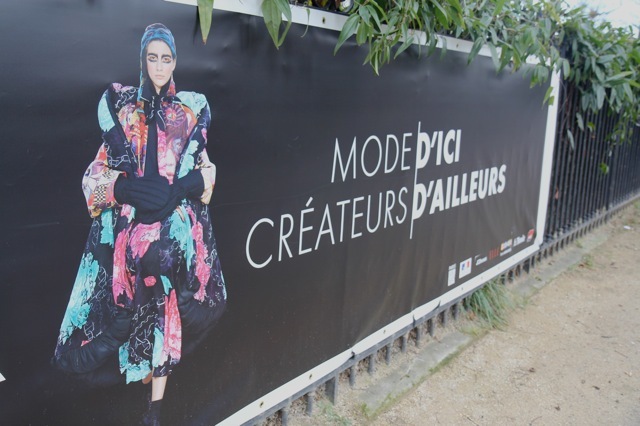 Several years ago he covered the quais and bridges on the Ile de la Cité with 10 metre long images of women’s eyes. The effect was moving, even before learning that they were the eyes of women who had witnessed great tragedy; war, famine, assassination. Last year he photographed anonymous Parisians for large banners that were unfurled the façades of the Bibliothèque National, covering more than 10 stories of the monstrous, soviet inspired buildings. 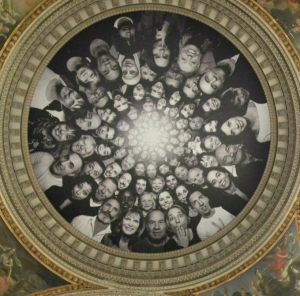 For the Pantheon, JR again features anonymous Parisians who waited in line for several hours to have their photos taken, knowing they may be selected for a tremendous project. They are of every race, religion, color, and style with a fashion sense that runs from the prosaic to the goofy. JR has lined them up and laid them out, like a human tower of babel. They are tiered in size, starting out larger than life and rising to the size of a miniature poodle. Working in black and white has given the work an aesthetic harmony. The images are printed out on large plastic tiles, then laid out like an oriental carpet, covering the cross-shaped floor, where visitors are invited to walk. The effect is astonishing. You are walking on art. You are walking on people. And the people are gorgeous, in a wonderful, very real way. I won’t claim to have defined art for the world, but as I walked through the show I decided that for me, art is something that moves people. 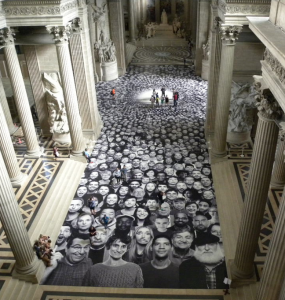 I may like it, I may hate it, or I may be anywhere in between, but it evokes a sensation somewhere inside and for me, JR’s installation at the Pantheon is a tremendous work of art. Its that time again… our weekly adventure with Karen Samimi. 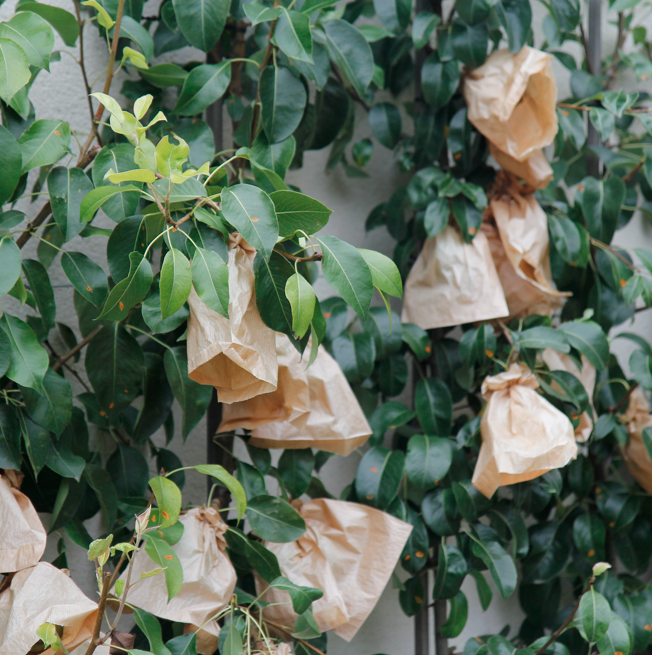 Today we’ll be going to a place almost as exotic as yesterday’s gardens. 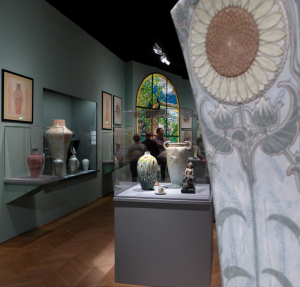 The Cité de la Céramique (City of Ceramics) – Sèvres & Limoges honors France’s role in the history of fine porcelain and was created in 2010 with the merger of the National Ceramic Museum in Sèvres and the Adrien Dubouché National Museum of Limoges. The Sèvres site, located right on the Seine, consists of 25 historic buildings, with 2 dedicated museums: one, the National Porcelain Manufacture (Factory), created originally in Vincennes in 1740 and moved to Sèvres in 1756, and the other, the National Ceramic Museum, inaugurated in 1824. Even today the Manufacture produces works of art in porcelain using techniques that have been handed down for generations. 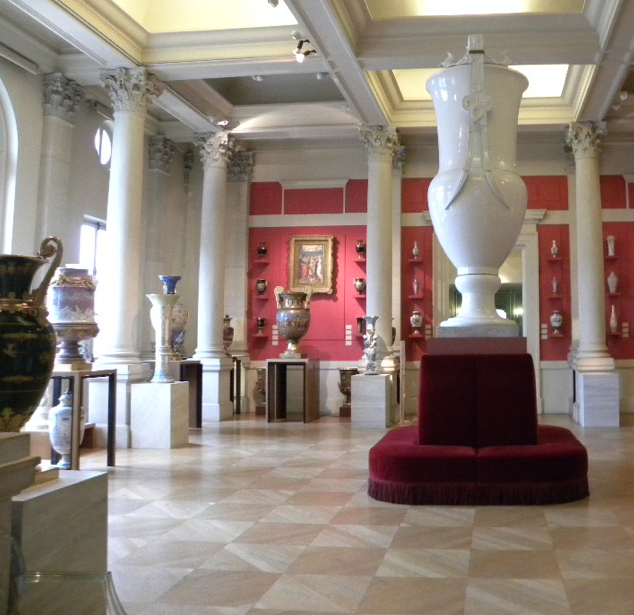 The Museum holds a world-famous collection : 50,000 ceramic objects from across the globe. 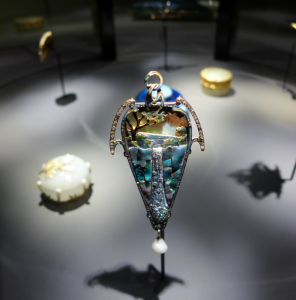 The Limoges location houses the finest collection of Limoges porcelain. 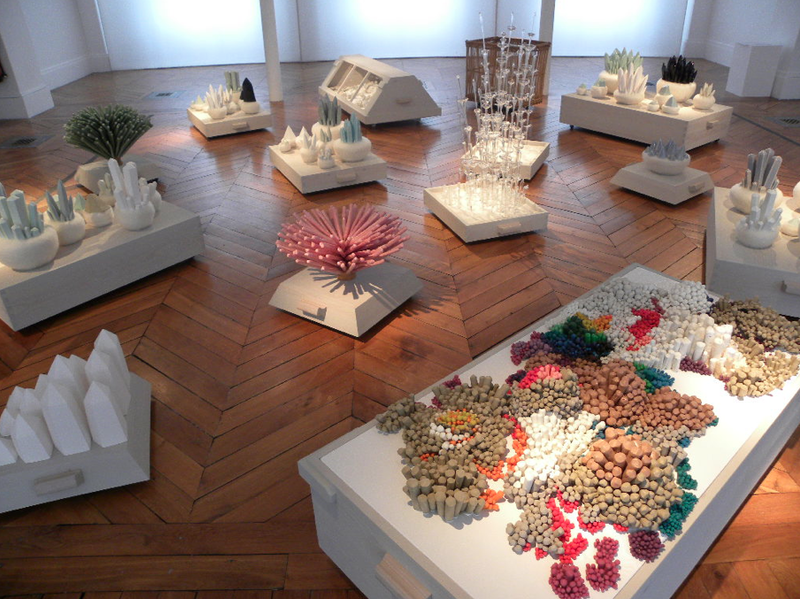 The City as a whole is an international center for ceramic and enamel applications in art & design, creates, produces and repairs porcelain, and promotes cultural activities for all ages. Romane Sarfati was named the first female director of the City in May, 2014 by the French Minister of Culture and Communication. To enter the museum, walk up the central outdoor staircase to the reception area on the first floor. 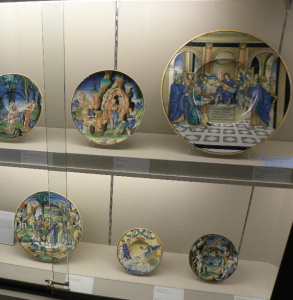 To the right is a wing devoted to the history of ceramics through the ages and has multimedia equipment for learning about producing porcelain, with masterpieces from Antiquity, Middle Ages, Asia, Islam, the European Renaissance, and the Americas. In the wing to the left is a contemporary exhibition gallery and the Sales Gallery, where exquisite porcelain manufactured in Sèvres may be purchased. The second floor houses a collection of 17th to 20th century European porcelain, and the 3rd floor is used for temporary exhibitions. The Manufacture building is not regularly open to the public. and can be visited by groups with advance reservations, by individuals on specific tour days, or on the annual National Patrimony Day in September. I enjoyed visiting the Large Vase Room located on the second floor and it was interesting to learn the definitions and see examples of the different types of ceramics: pottery, earthenware, stoneware, porcelain, biscuit, and glass. I also enjoyed trying out the interactive exhibit to create my own personalized plate using motifs specific to the Sèvres collections. Be sure to notice the display of decorative porcelain toilet chairs used by royalty. Open every day from 10 am to 5 pm except Tuesdays, January 1, May 1, and December 25. 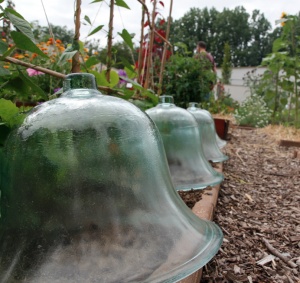 Guided tours for groups and individuals available. Theme tours available one Monday a month. Free for visitors under age 18, ages 18-25 with European nationality, job seekers, handicapped, and on the first Sunday of every month. 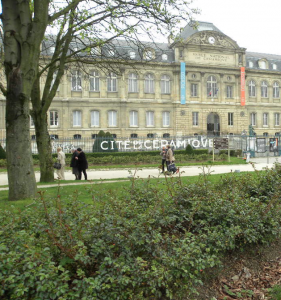 Paid parking available in front of the City, at the Tramway station and at the entrance to Parc de Saint-Cloud. 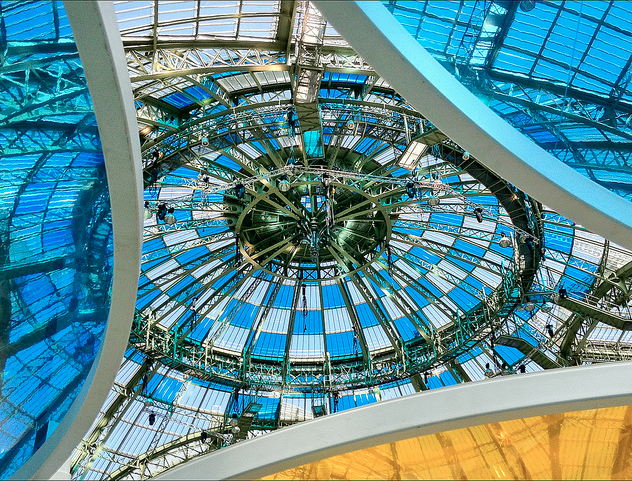 Le Grand Palais is all dressed up and ready to party for the summer, with three shows running right now. 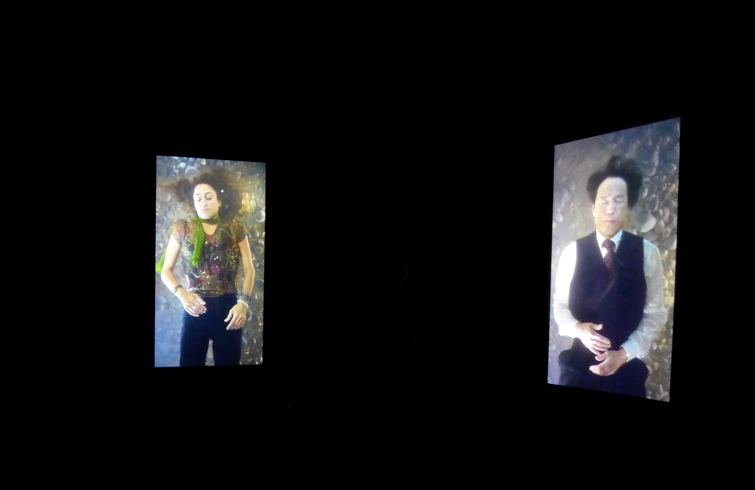 By far, the most popular is the show dedicated to the famous video artist, Bill Viola. 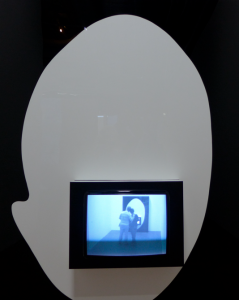 As someone who has never seen an exhibition dedicated entirely to a video artist, I found it interesting to wander from room to room, usually arriving in middle of a piece. The challenge then becomes trying to figure out what is going on on screen, reading how long it lasts and then deciding if you want to stay around long enough to see it all. 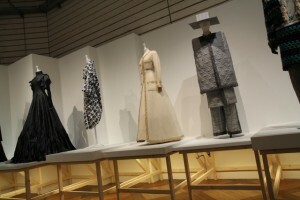 Some pieces involve multiple screens, some rooms featured several pieces in one space. Bill Viola definitely has a gift with light. One piece looked like the stage could have been set by Vermeer and sparkling crystals of light are held by water in all its forms. Two themes run throughout the show; fire and water. There is not a lot of subtly on display and frankly, I had “gotten” it half way through the show. But I stayed: mesmerized by the experience. Reading his biography, I read that like Hitchcock, the artist works in close partnership with his wife, without giving her much credit. 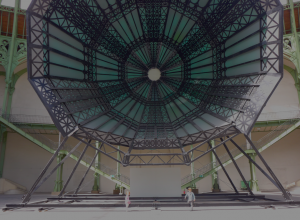 Unlike Ilya and Emilia Kabakov, a couple that shares double billing and the artists behind Monumenta, an annual show in which one artist (or a small team) is invited to create one piece to fill the immense Grand Nef. It is a difficult challenge, that stumped monumental artist par excellence Richard Serra. But when its done right, like it was by Daniel Buren and Anish Kapoor, it can take your breath away. The problem with Monumenta is that it is very expensive, and it was lost to budget cuts. A very affluent Russian stepped in, offering to foot the bill for the entire show, if the state agreed to offer the prestigious role to the relatively unknown Kabakov’s. Walking in, there is a stupendous amplifier, with a design that evokes the Eiffel Tower as it projects mystical sounds. It moves those who walk past, quite literally with the vibrations of sound waves rolling through the space. The rest of the show was a complete let down, exploring themes of angels and cosmic energy, like a stroll through Haight-Ashbury without any of the charm and absolutely no respect for the monumental space. We’ve avoided Mapplethorpe show, not because you have to be 18+ to enter, but because there is never a line. A very bad sign for any exhibition in Paris, and one that has scared us off, given the very few hours we have to wander each week. I hear from La Fashionista that it’s just a lot of penises. There were a lot less penises exposed on the traditional Roman sculptures at Moi, August, a surprisingly phenomenal show, following the history of the Roman Emperor that gave us the city’s favorite month. It took me a while to translate the French names for familiar Latin titles, back into something my brain could recognize, but once that was assimilated, the enthralling history, art and objects transported us to another place and time. One of the frustrations of being a photographer is trying to convey movement in time. Videos do the trick, but lack the discipline you can only get from a still camera. Colombian photographer, Oscar Munoz faces this dilemma with mixed media; printing out still images on surprising materials, creating dynamic images that move the viewer. He is not a photographer. He calls himself a protographer. 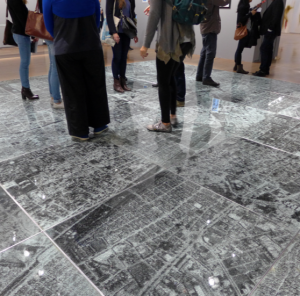 His show, which opened today at the Jeu de Paume, begins with an aerial photo of his hometown, Cali, Columbia that is laid out on the floor, under broken safety glass that continues to break down as viewers enter the exhibition, unable to avoid walking on the art. In Cali, in the 50’s and 60’s anonymous men would photograph people as they passed by, then develop the images, hoping to selling them to the subjects photographed, much like the photos that are sold when leaving roller coaster rides today. A light table in the corner displays a collection of the photos that the artist had projected over a river in Cali. It is the introduction to another theme. 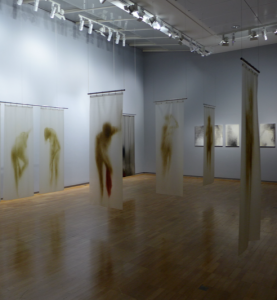 Beyond movement, Mr Munoz’s work is awash in water. Water that cleanses, purifies, erases; his subjects shower, their images printed on hanging shower curtains. Fading images of the dead are projected onto shower floors, drains included. Which brings us to the next theme. Death. Many, if not most of the photos used are of people who have passed. The anonymous photos from the 50’s and 60’s are just the beginning as the artist projects obituary photos from the newspaper into his ephemeral world. In one room, a row of metal disks line the wall. Exhale your breath onto the disk and the silhouette of an obituary photos appears, then disappears before your eyes, only to reappear again with your very next breath. A second light table reveals a collection of photos with sinks at either side of the work surface. The image of a hand reaches over the table, grabs a photos and rinses it in a sink, the chemicals washing away, the image disappearing and the now white paper returned to its place. Moments later, the hand returns, grabs the blank rectangle, places it in the second sink, the water returns an the image is washed back on to the paper. It is a mesmerizing moment and a great tribute to modern protography.